these past few weeks i've had a lot of sewing mileage. quilt market being right around the corner means lots of sewing to display what your product can do. i've been asked to show off my collection of threads with aurifil at a schoolhouse for aurifil, so i've been doing some fun projects that include my collection, like that little zippered pouch, and now these lovely flowers. 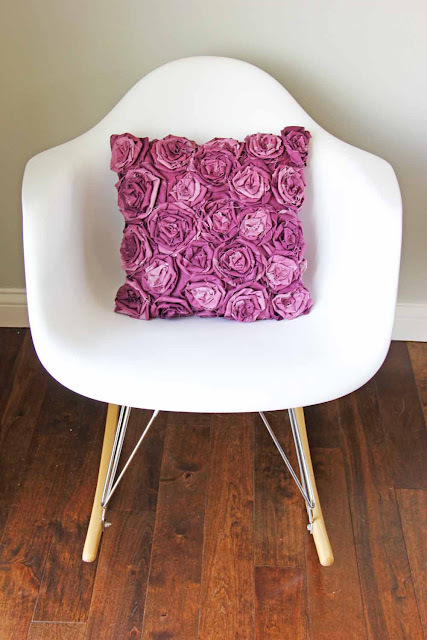 this is the twisted flower pillow i show you how to make in my craftsy class. back when i was filming the class my fabric line hadnt come out yet. i used different shades of the same color and it turned out pretty cute as well. but i'm happy how this pillow has turned out with the ombre fabric. i'm going to make a couple more in different colors to show how wonderful it is to have thread collections that go so perfectly with fabric lines so that when you create there's no guessing on which shade of color in thread you will need. so off to go create a few more things. and i am of course working on a few how to's for here on the blog, and for a few other places. very busy and blessed i feel. we'll talk soon! i'll show you more of what i'm making as i make it!!! hope you are enjoying the little bit of spring that has finally decided to show up in some places! That pillow is stunning!! I love it!!! Can't wait to see your fun booth at market!! I signed up for your class a while back, but haven't had a chance to watch any of the lessons yet. Good thing Craftsy classes are forever. :) I LOVE your pillow! Gorgeous! What a beautiful cushion - you are very clever. Love your fabric too. Wow! Wow! and backwards, woW! Ordering and will check out the Craftsy! Oh my God, that pillow. Just lovely! 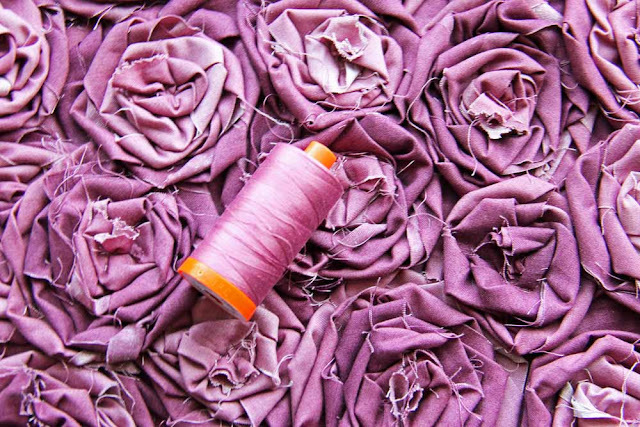 The purple is perfect with the abundance of rosettes—romantic but also a little offbeat. You should consider putting a picture of this on Kollabora, the crafting and DIY community. I almost never see exciting cushions, and when I do, I want all my crafty friends to see them too. V and Co: why yes...i'm still sewing.